It is that time of the year again when we have left over eggnog. I have posted a few eggnog recipes before: Eggnog Biscuits, Eggnog Flan and Eggnog Eclairs. This year I hope to make some more recipes with my leftover eggnog. These muffins were the first new recipe that I made with eggnog this year. They taste great and have a strong eggnog flavor. The brown butter glaze is decadent. I plan to repurpose some of these muffins into a dessert with eggnog custard. I’ll keep you posted. I got this recipe from How Sweet Eats blog, but changed it up into a gluten free version and added some nuts. Be careful not to over bake these as the just baked ones were much moister than those that baked a bit longer. 1) Preheat the oven to 350°F. 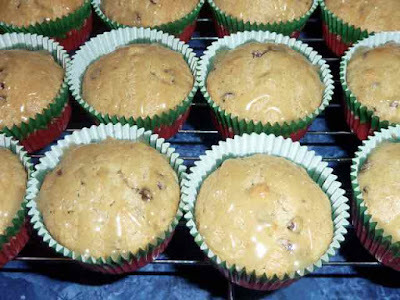 Place paper liners into two muffin tins and set aside. 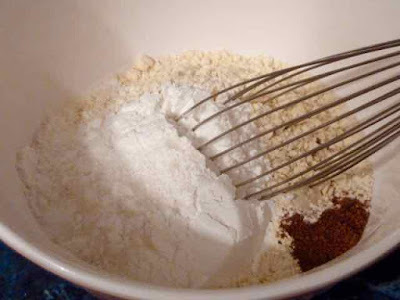 2) In a small bowl mix together the flours, baking soda and powder, xanthan gum, nutmeg and salt. Set aside. The dry ingredients ready to be whisked together. 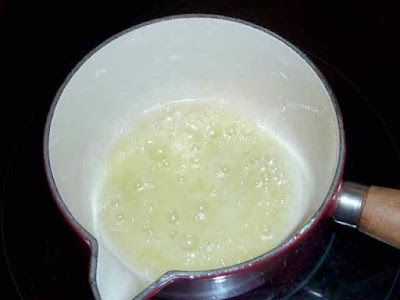 3) In a large bowl add the melted butter and sugar and mix until smooth. Mix in the vanilla well. 4) Add the eggs, one at a time, mixing well after each addition. 5) Add half the flour mixture and stir in. Add all the eggnog and mix well. Add the rest of the flour mixture and combine well. Adding half of the flour mixture to the batter. 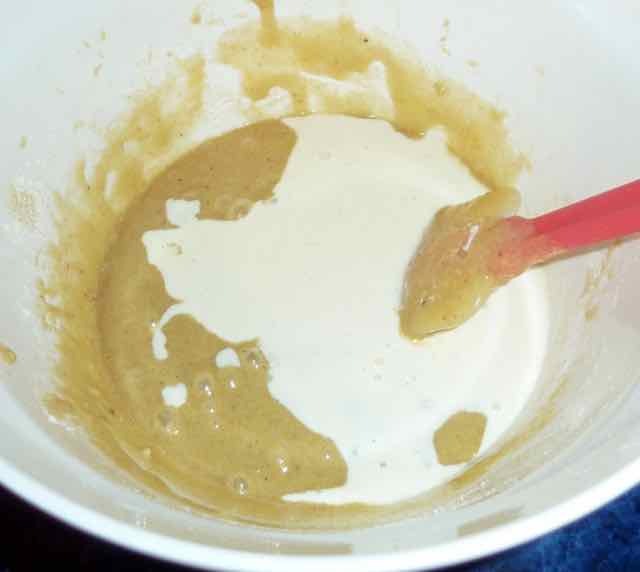 Adding eggnog to the batter. Adding the remaining flour mixture to the batter. 6) Add the nuts and chips and mix in until well distributed. 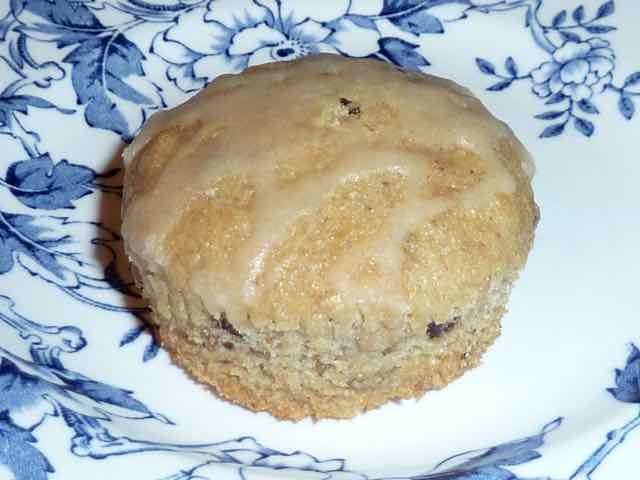 7) I used a scoop that measures 2-inches across to scoop out batter into the paper lined muffin cups. 8) Bake for 17-20 minutes or until the cake is just set. It will be dry if over baked so check every minute after the first 15 minutes to see if the cake is done. 9) Allow to cool completely on a rack before topping with the glaze. 1) First make brown butter by heating the butter in a pan with a light colored bottom until the butter turns a light brown and has a nutty aroma. Using a light colored pan allows you to see how brown the butter is getting. Use a medium low flame and stir the butter constantly until done. The butter will foam up while cooking, this is to be expected. Do not walk away while it is cooking because the butter can burn very quickly and be ruined. 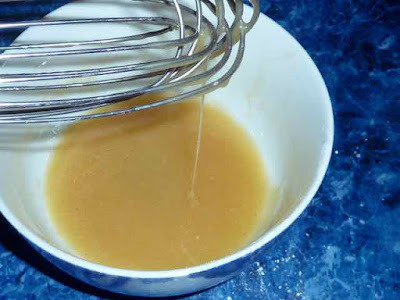 When the butter is the right color and fragrance remove it from the heat and allow it to cool before making the glaze. 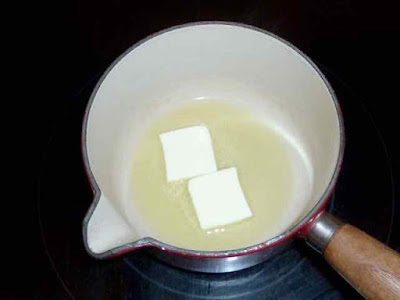 Melting butter in a light colored pan. Butter cooking over a medium heat. Note how it is foaming. Butter after browned and emitting a nutty aroma. Sometimes I let it get a little darker. 2) Sift the powdered sugar into a small bowl. Add the eggnog. Pour in the browned butter through a fine sieve to keep the sediment from the bottom of the butter pan from getting into the glaze. Whisk all the ingredients together until smooth. The glaze after mixing in the eggnog. 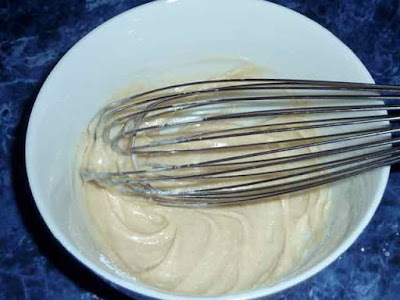 See how it is thin enough to drizzle off of the whisk. 3) Add more eggnog if the mixture is too thick and more powdered sugar if too watery. 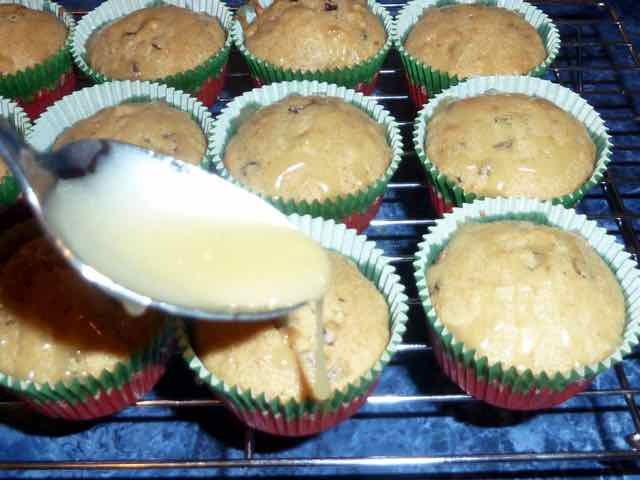 When the desired consistency is reached, spoon some glaze over each cupcake. Drizzling glaze over the cupcakes. 4) The glaze will set in about an hour. 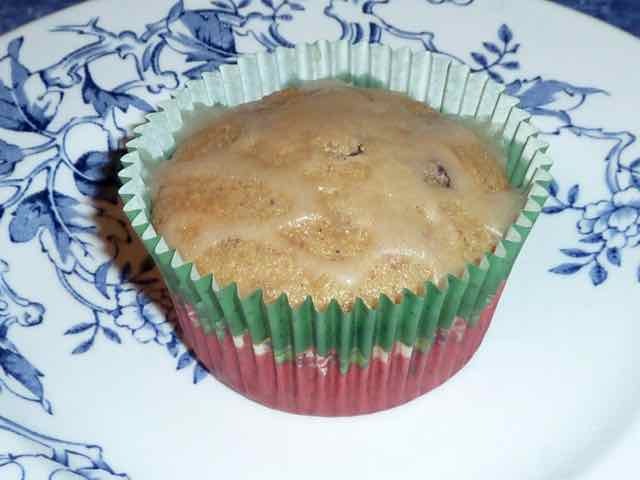 EGGNOG CHOCOLATE CHIP AND NUT CUPCAKES WITH EGGNOG BROWN BUTTER GLAZE Makes 22-24 GlutenFreeBakingBear.com Ingredients CAKE ½ cup/4 oz. Unsalted Butter - melted ½ cup Sugar 2 tsp Vanilla Extract 2 large Eggs 1 cup + 2 Tbs. Sorghum Flour ½ cup Tapioca Flour ½ cup Chickpea Flour ¾ tsp Xanthan Gum ½ tsp Ground Nutmeg ½ tsp Baking Soda ½ tsp Baking Powder ¼ tsp Sea Salt ¾ cup Eggnog ⅔ cup Chocolate Chips ⅔ cup Chopped Walnuts or Pecans GLAZE ¼ cup Brown Butter ¼-½ cup Confectioner’s Sugar 2-3 Tbs. Eggnog Directions CAKE 1) Preheat the oven to 350°F. 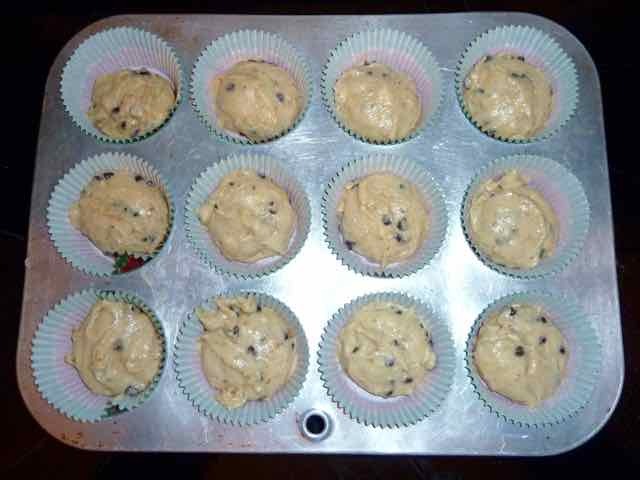 Place paper liners into two muffin tins and set aside. 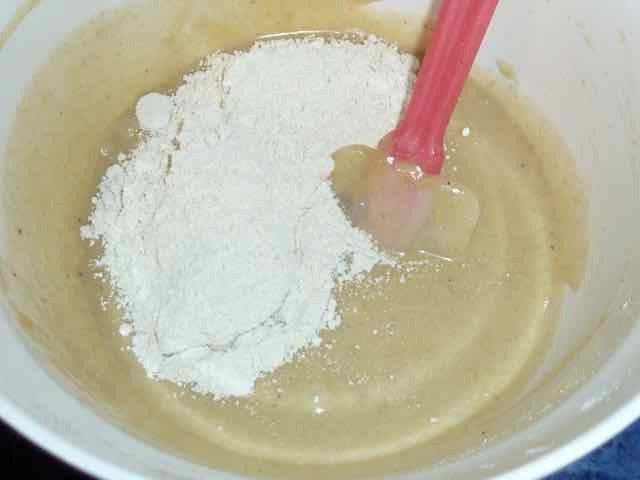 2) In a small bowl mix together the flours, baking soda and powder, xanthan gum, nutmeg and salt. Set aside. 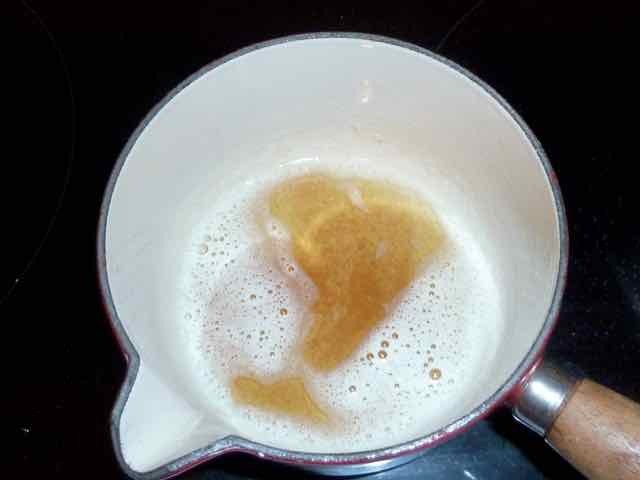 3) In a large bowl add the melted butter and sugar and mix until smooth. Mix in the vanilla well. 4) Add the eggs, one at a time, mixing well after each addition. 5) Add half the flour mixture and stir in. Add all the eggnog and mix well. 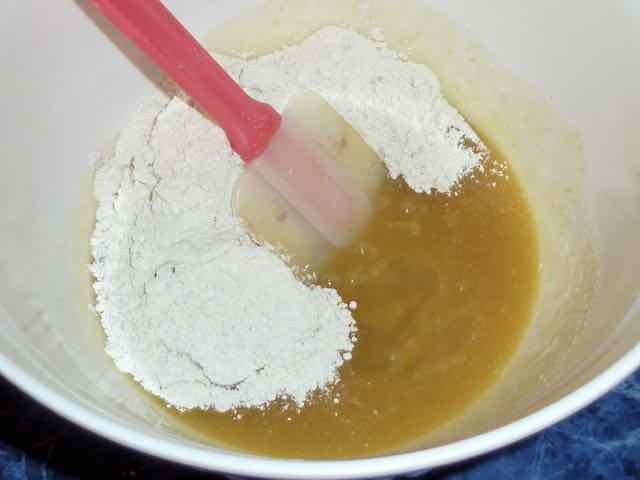 Add the rest of the flour mixture and combine well. 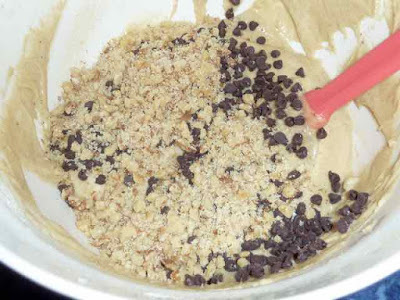 6) Add the nuts and chips and mix in until well distributed. 7) I used a scoop that measures 2-inches across to scoop out batter into the paper lined muffin cups. 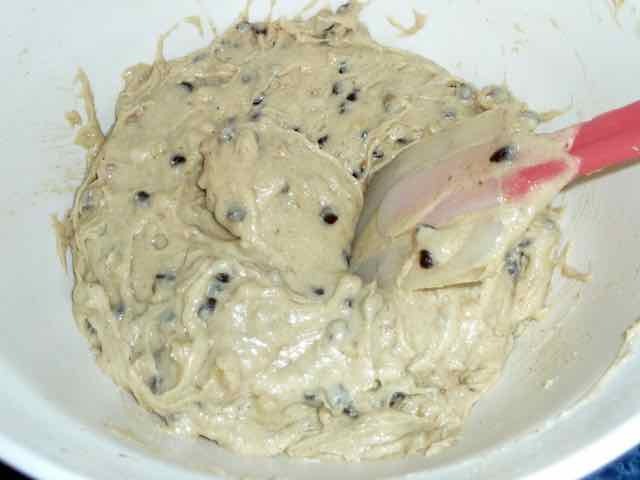 8) Bake for 17-20 minutes or until the cake is just set. It will be dry if over baked so check every minute after the first 15 minutes to see if the cake is done. 9) Allow to cool completely on a rack before topping with the glaze. GLAZE 1) First make brown butter by heating the butter in a pan with a light colored bottom until the butter turns a light brown and has a nutty aroma. Using a light colored pan allows you to see how brown the butter is getting. Use a medium low flame and stir the butter constantly until done. The butter will foam up while cooking, this is to be expected. Do not walk away while it is cooking because the butter can burn very quickly and be ruined. When the butter is the right color and fragrance remove it from the heat and allow it to cool before making the glaze. 2) Sift the powdered sugar into a small bowl. Add the eggnog. Pour in the browned butter through a fine sieve to keep the sediment from the bottom of the butter pan from getting into the glaze. Whisk all the ingredients together until smooth. 3) Add more eggnog if the mixture is too thick and more powdered sugar if too watery. When the desired consistency is reached, spoon some glaze over each cupcake. 4) The glaze will set in about an hour.